Right wing step up campaign against Corbyn: There is a concerted attempt by Labour's right, cheered on by the poisonous capitalist media, to completely undermine the effects of Jeremy Corbyn's leadership victory and what it represents. The Tories call themselves the "workers' party" while desecrating jobs. Let's put them out of work. General practitioners (GPs) are being paid to reduce referrals to hospital in some areas. Smug Tories discussed letting pensioners die of cold to save cash at their Manchester conference. After years of failing to pay women equally, Derby City Labour council's pay review will see many women and some male council workers lose thousands of pounds from their annual pay. In this year's election, Portsmouth RMT member and TUSC supporter Sean Hoyle has emerged as the strongest left candidate, receiving 37 branch nominations, making him best placed to continue building a fighting, democratic, socialist trade union. The last steel plant on Teesside, the second largest in Europe, is to be mothballed resulting in the loss of up 2,200 jobs. Short reports on some of the latest trade union struggles. Traffic wardens' sick pay, victimised CWU rep John Vasey, 'Kill the Bill' lobby, junior doctors protest. Inspired by Jeremy Corbyn, students have rallied to Socialist Students at freshers' fairs. The council intends to create a service for "property owners who have only one property". While this would be a step forward, it is quite a limited letting service. Labour-controlled Derbyshire County Council has failed its first post-Corbyn test. Despite the council leader publicly declaring her support for Corbyn, the council voted to back its decision to decimate its school crossing patrol service, part of a £157 million cuts onslaught. Catalan elections on 27 September revealed a society virtually split down the middle on the question of independence from the Spanish state. Short stories on workers' struggles around the world. Refugee solidarity in Austria and Greece, water protests in Brazil. The ever-dwindling numbers of affordable homes to buy or rent is behind the deepening housing crisis in the UK. Jeremy must give genuine socialists in the Labour Party the mechanisms to kick the Tory entryists out once and for all! 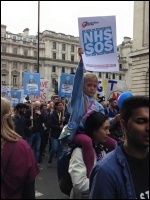 Jeremy Hunt, the hated Tory health secretary, is under attack from the medical profession. He plans to exhaust and demoralise junior doctors with "unsafe and unfair" contract changes. Meanwhile, a survey says around half of nurses are considering quitting. And the government plans to make trainee nurses pay to work! Resist the Tories and the Blairites: The majority of ordinary people will have cheered when they saw that shadow chancellor John McDonnell reversed his position and pledged that Labour will vote against the Tories' charter for fiscal responsibility. Should trade unions be re-affiliating to the Labour Party? In light of Jeremy Corbyn's victory, is the issue of non-affiliated unions affiliating to Labour now on the agenda? The privatisation of Royal Mail is deeply unpopular but clearly the biggest draw to this rally was the main speaker, Jeremy Corbyn. Several councillors have responded positively about starting a discussion, though many express concerns about the practicalities of setting no-cuts budgets. The five day strike by traffic wardens in Hackney, a bid to get proper sick pay, has been suspended to allow talks. Rank-and-file socialist Roger Bannister has received the 25 branch nominations needed to run for general secretary of Unison, Britain's largest public sector union. It is clear that austerity measures to state education services do not affect us all equally, and further education colleges are bearing the biggest brunt of cuts to education. Short reports on some of the latest trade union struggles. Redcar steel plant closure, campaigning to stop the Trade Union Bill, junior doctors protest against contract changes. Socialist Party members worked tirelessly to raise over £15,000 in September to smash our quarterly fighting fund target, reaching 110%. There are only three places in England the homes would be cheap enough to buy on the new £9 'National Living (minimum) Wage': Barrow-in-Furness, Southport, and Hull. The social media multinational paid just £4,327 in UK corporation tax. This is compared to the total £4,800 income tax paid by a couple each earning the median wage of £22,000. Tory government plans to increase junior doctors' hours and cut pay - as part of its '24/7' NHS service - have incensed staff who already work long hours, including weekends. Right-wing rag the Daily Mail has featured the Bake Off winner on their front page every year since the series began. Until last week. It was with overwhelming shock that I learnt my family stands to lose around £140 a month. Tory cuts to tax credits will hit us hard when implemented in 2016. 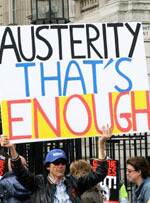 Some families stand to lose up to £1,700 a year. At the headquarters of infamous retailer Sports Direct, ambulances were called more than 80 times over two years. It's one world for the super-rich, and another one for the rest of us. Tories want us to 'work like Chinese', Royals have flight paths redirected away from their home, yuppie cafe mocks the poor. Even productive under-25s need to take a break! London Socialist Students went on its annual Karl Marx pub crawl on 8 October. Crown Packaging Unite convener: "Fight to keep this plant open"
Political thriller Homeland was targeted by graffiti artists hired to help with set dressing, subversively daubing "Homeland is racist" in Arabic on the walls. More than 800,000 refugees are officially expected to come to Germany this year. The government has announced budget cuts 'because of the refugees' and commentators demand scrapping the minimum wage of €8.50 an hour for refugees. Short stories on workers' struggles around the world. Iberian political school, Hong Kong socialist election campaign, Kshama Sawant's birthday. David Cameron announced at the Tory Party conference his "all-out war on poverty". It's clear that what he meant was an "all-out war on the poor". Older people are hard hit by the bosses' cuts and sell-offs. Sue Powell spoke to Claude Mickleson, National Pensioners Convention activist and member of Gloucestershire Socialist Party. TV review: We Want Our Country Back. Tiny far-right group 'Britain First' has attracted disproportionate levels of media coverage over the last year. It's one world for the super-rich, and another one for the rest of us. Housing crisis versus landlords' profits, extortionate cost of football. Around the country campaigns are establishing networks to defend Jeremy Corbyn's anti-austerity politics. Socialist Party members are enthusiastically taking part. We now live in a world where the richest 1% of the population owns more than half the wealth. And the poorest half owns less than 1% - according to the latest Credit Suisse Wealth Report. The Socialist Party was recently approached by New Statesman magazine to respond to the election of Jeremy Corbyn as Labour leader. Unfortunately our answers were not used in the resulting article. 250 workers at Crown Packaging in South Wales face redundancy. The plant - known locally as 'the Box' - is to close due to alleged 'overcapacity'. The Trade Union Co-ordinating Group hosted a rally at parliament on 12 October to oppose the Tories' new anti-union bill. Inspectors at two-thirds of NHS hospitals have identified low staffing as a problem. Jim Fitzpatrick, MP for Limehouse and Poplar, refused to back striking cleaners. His reason? In 1968, some dockers walked out against the sacking of racist Tory minister Enoch Powell. Short reports on some of the latest trade union struggles. Unison Scotland calls for no-cuts budgets, London DLR cleaners dispute, Arriva Wales train strikes, Alfreton Grange Arts College walkout. 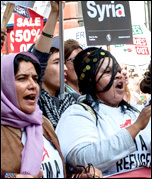 A major event in the Cardiff Housing Action campaign took place on 17 October: the 'Wales March for Homes'. As a Sports Direct employee you not only slave in workhouse conditions, you can also be illegally sacked with 15 minutes notice. Can you increase your membership subs (regular donation)? This is the question the Socialist Party is asking all our members. How can workers resist capitalist cuts and closures? Unison members need a general secretary who will put their interests first. Hull council, run by Labour, is pre-empting the Tories' trade union bill. It is issuing redundancy notices to all five full-time council union organisers. Workers and communities don't have to accept massive cuts and closures as inevitable. Labour attempted to ban new grammar schools in 1998. The Tories have allowed one in Kent - by labelling it an 'expansion' of an existing school. What better way to communicate with adults about pensions than with a multi-million-pound computer-generated soft toy? How can we help students excel? In schools up and down the country, teacher training sessions are taking place on 'growth mindset'. Hull City Council, run by Labour, is pre-empting the Tories' trade union bill by issuing a redundancy notice known as a '188 notice' which threatens the council's five full time union convenors. 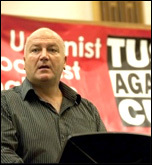 Socialist Party member Roger Bannister is standing for election as general secretary of Unison. 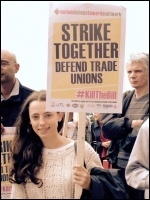 The TUC lobby of Parliament on 2 November needs to mark a major change in the fight against the Tory anti-trade union bill. Can you make a donation to the Socialism 2015 finance appeal? We are aiming to raise £25,000 and set a record total for our annual fighting fund. 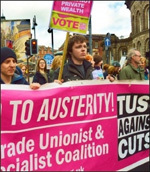 Warrington TUSC councillor Kevin Bennett has called on the town's Labour-controlled council to back Jeremy Corbyn's anti-austerity stance and vote against new cuts to council services. New film Suffragette is a partial view of working class women's fight for the vote. The recent visit of Chinese Premier Xi Jinping seems to have sealed the deal on the Hinkley Point C nuclear reactor - a deal which is disastrous in every aspect. This has been the deadliest month in the national conflict since the war on Gaza in summer 2014. 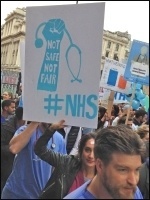 5,000 junior doctors descended on Newcastle from across the North East on 24 October. After weeks of criticism, Tory health minister Jeremy Hunt released the report 'Sugar reduction: the evidence for action' on 22 October. The power of protest was clear on 23 October. Angry students gave orders to a senior diplomat and prevented the arrest of a peaceful demonstrator. Around 100 Leeds students stopped city centre traffic on 24 October as we marched for free education, writes Amy Cousens, Leeds Fight for Free Education.